Developed in the 1970s, the P11 is a bulky weapon for use by combat divers. It uses five battery-ignited sold rocket propelled 7.62x100mm darts, each in their own barrel. The weapon cannot be reloaded by the operator, but must be returned to H&K. The range of the weapon varies according to the depth of the operator, and is only good for 100 feet or so in air. GM Information: The P11 has a PM: -2 and ranges of CLOS: 0-2 and LONG: 4-10 in the atmosphere. For every 20′ depth after the first, the LONG: range decreases by one. Once the lower rating of long range is equal to close, all shots are long range. 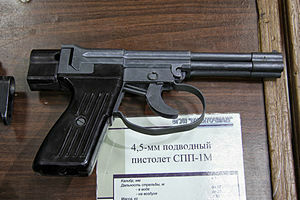 Made by TOZ (Tulsky Oruzheiny Zavod) in 1971, the SPP-1 fires 4.5x40mmR steel darts each in one of the four barrels of the pistol. 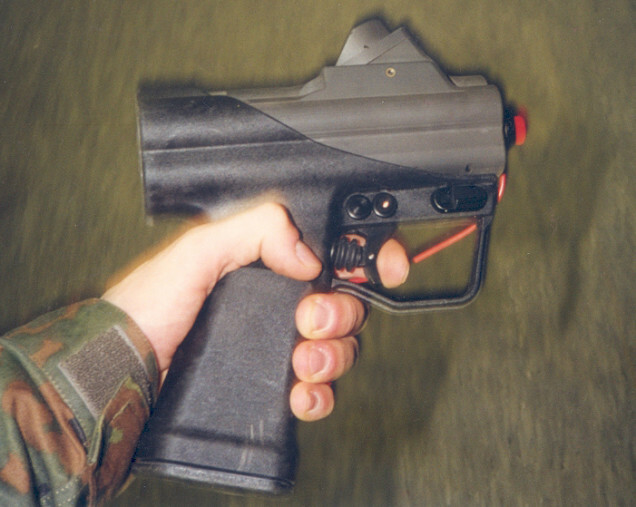 Unlike the P11, the SPP-1 has a break-open action allowing the operator to reload the weapon. The barrels are smooth-bored and use hydrostatic effects to stabilize the round; in the air, the weapon is highly inaccurate. GM Information: The SPP-1 has a PM: -2 and ranges of CLOS: 0-1 and LONG: 4-6 in the atmosphere. For every 20′ depth after the first, the LONG: range decreases by one. Once the lower rating of long range is equal to close, all shots are long range. The APS was specially designed for Russian combat divers and uses a proprietary 5.66mm round that fires a steel dart from a specialized rifle casing. The gun is a smoothbore and uses hydrodynamics to stabilize the round. Out of the water, it is inaccurate, short-ranged, and without the buffering effect of water in the action, sees a dramatic rise in wear from use. GM Information: The APS has a PM: -1 and ranges of CLOS: 0-1 and LONG: 6-15 in the atmosphere. For every 20′ depth after the first, the LONG: range decreases by one. Once the lower rating of long range is equal to 2, all shots are long range. Used in air, the APS has a JAM of 90+, but the action is rendered useless on a jam and cannot be repaired in the field. 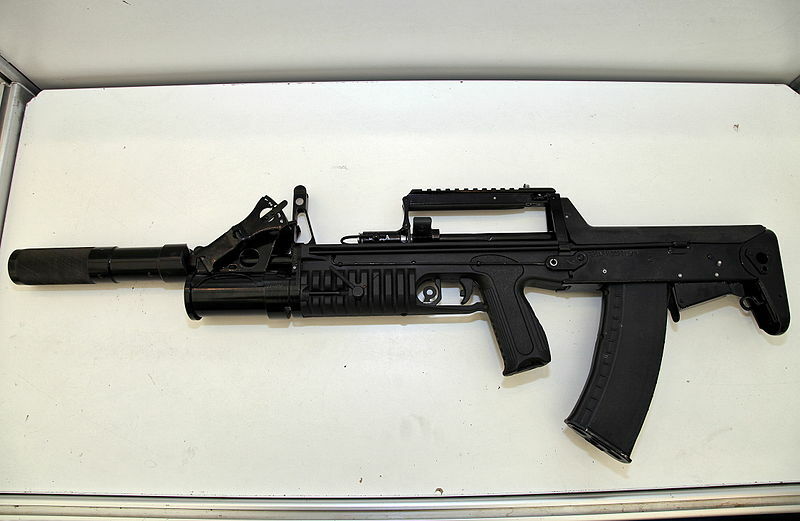 Designed to overcome the inherent issues of an underwater weapon, the ADS was designed to be used in water or in the air, using a standard AK-74 magazine for 5.4rx39mm ammunition. Spetnatz and combat divers need to carry two different types of ammunition (the 5.45x39mm PSP for underwater, and any of the standard 5.45mm on land) to use the weapon, but the action does not suffer damage as the old APS did, and the effectiveness of the weapon is retained on land. GM Information: the range of the ADS is CLOS: 0-4 and LONG: 7-14 in the water, with -1 to the LONG range for every 30′ below the first. When the lower number of the LONG range reaches 4, all shots are long range. Nice weapons – I’ll definitely be looking to use these in a future game. BTW – have you seen the new Classified RPG that’s be put up on DriveThruNow (and also at Lulu)? It’s basically a retro of the JB 007 RPG with weapons and gear brought up-to-date for the modern day. It’s produced by Expeditious Retreat Press. They’ve also produced a new mission called Operation Rogue Lion. I just thought you might be interested as I recall you had intended to bring your own modified version of the rules out at some point in the future. I’ve seen it. They basically did no real changes to the system; I’m doing more substantial changes. It’s slow going with the kid, the new novel, etc. (hell, I almost bought a coffeeshop a few weeks back) the game keeps getting bumped. Yep, as I said, it’s basically a retro; but at least the equipment has been updated. Sorry to hear that your version keeps getting bumped – I’m quite interested to know what changes you are planning. BTW, if you need any playtesting my group will be happy to help; they love the JB game and keep asking me to run some more sessions. I will definitely keep you in mind. The kid is steadily getting independent enough to grab back more of my work time. She’s inching into the “go out and play” stage, where I can have her go entertain herself.